What does it take for an idea to spread from one to many? For a minority opinion to become the majority belief? According to a new study by scientists at the Rensselaer Polytechnic Institute, the answer is 10%. Once 10% of a population is committed to an idea, it’s inevitable that it will eventually become the prevailing opinion of the entire group. The key is to remain committed. 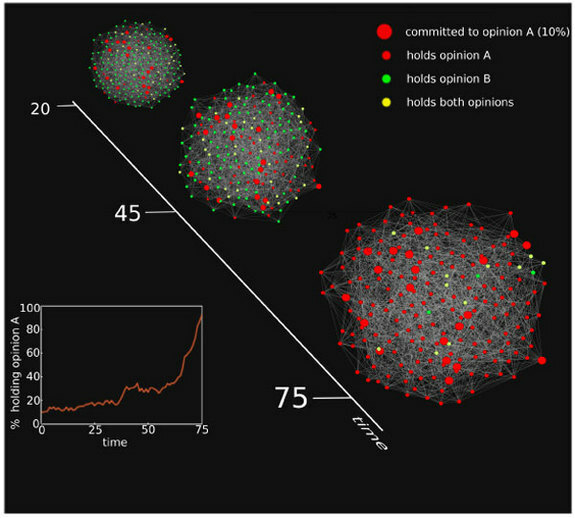 We show how the prevailing majority opinion in a population can be rapidly reversed by a small fraction p of randomly distributed committed agents who consistently proselytize the opposing opinion and are immune to influence. Specifically, we show that when the committed fraction grows beyond a critical value pc=10%, there is a dramatic decrease in the time Tc taken for the entire population to adopt the committed opinion. In particular, for complete graphs we show that when p<pc, Tc~exp[a(p)N], whereas for p>pc, Tc~lnN. We conclude with simulation results for Erdos-Rényi random graphs and scale-free networks which show qualitatively similar behavior. But what happens when 10 percent of a population holds one opinion, and another 10 percent hold the opposite view? Which one wins, and why? That's what I want to know. If 10% strongly support environmental causes and 10% strongly support Tea Party causes, who wins? And surely there are 10% who are committed to pro-life and 10% who are committed to pro-choice. Do we just remain in limbo? I find the claims dubious in the extreme, due to the magic power of ten. This sort of claim only holds up in mathematical models, not real life. To illustrate, if 43 of Congress persons (roughly 9.9%) hold an opinion, “It would literally take the amount of time comparable to the age of the universe for this size group to reach the majority.” But if they convince one Congress person, it is inevitable and “the idea spreads like flame.” But what if, as is not unlikely, 44 Congress persons hold the exact opposite idea? Wait, wait, this "10%" figure is for one specific toy model of opinion formation (the binary agreement model), on one specific graph (the complete graph). I could come up with equally plausible models, or different graphs, for which the figure would be 2% or 50% or anything you like. At best, you should take away from the paper the idea that there is some threshold: below it, the opinion spreads, above it, it doesn't. This is a very familiar phenomenon from all sorts of models of epidemics and the like. Really, it's not appropriate to say that "according to a new study by scientists at the Rensselaer Polytechnic Institute, the answer is 10%" as if that number 10% says anything about the real world. The study uses a model where there exists a small percentage of "committed agents" who consistently proselytize the opposing opinion and are themselves immune to influence while the others are not "committed" or "immune". community structure. Yet one of them, SCNARC Director Boleslaw Szymanski, makes the quoted claims about "always" vs, "the age of the universe". I think I am quoting correctly from "The Management of Power" by R J Swingle, that it takes about 3% of the population to organise an effective civil disobedience campaign and about 10% to start a civil war. If so, you can take 3% as being the absolute minimum tipping point. For those who abhor the tyranny of ten, the tipping point for the capitulation of minority regimes in Southern Africa was when the ratio of oppressors to oppressed got to about 1:8. "...the tipping point for the capitulation of minority regimes in Southern Africa was when the ratio of oppressors to oppressed got to about 1:8..."
Of course this is making some unsupported assumptions about which were oppressors, and which the oppressed. Have you all heard the good news about Jesus Christ, Incarnate God and Resurrected Man? Alas, this is meaningless. Why? Because it is irrefutable. Consider that you cannot measure "committed." You can measure 10%, but if their beliefs do not indeed ripple out to the rest, then you can just backtrack and say, "Well, I guess they weren't very committed." This is not to say that there's not some truth here. I think we all realized that small, committed group can make great headway. But in TRUTH it starts with ONE committed person...who wins another...who in turn wins another...on and on until we reach, I suppose, the 10% mark, and then it's all gravy from there. In some ways this is exciting. In others, it is a shame. The early Church turned the world upside down with their message. Yet today, in America, where the vast majority claim to be Christians, we are out-committed by small groups of atheists and anti-religion groups. We have the numbers; they have the commitment. A complete reversal from 33 A.D.
On your "TRUTH" of it starting with "ONE committed person," that is patently false. People can simultaneously and independently arrive at the same ideas. How about I rephrase that to say, "But in TRUTH it CAN start with one committed person...?" Because I agree that things can sprout up independently, so I think the rephrasing captures both of our notions. At the same time, even if one person here and one person there get the same idea at the same time, it is rippling outward from these single persons...until the ripples meet and join. More than 10% of the US population believes in Young Earth creationism (and they are pretty damn adamant about it). I highly doubt this figure will ever reach more than 50%. I doubt even further that if they did gain 50%, all 50% would be as adamant as the current 30% or so. This whole 10% idea would be more interesting if people would actually "stick to [their] guns." That tends to not be the case. The reason it is not the case is because people are not as loyal as we think they are. This brings me back to a marketing class I took. When discussing customer feedback to a business, many studies find that those who rate a service/product 5 out of 5 are very likely to be loyal and become fierce advocates in their own right. Stepping down just one level to 4s would mean the customer was still highly satisfied. Our assumption (as naive students) was that the 4s would still be rather loyal and even decent advocates. However, the same studies showed that their loyalty and advocacy was substantially reduced from that of the 5s. The lesson was that we should seek 5s when marketing our product/service and we should tailor our entire customer service and satisfaction thinking to getting as many 5s as possible. Yes, 4s are nice in the short run, but 5s are the ones who truly bring life to a product/service (think of how many Apple fanboys are running around and what they are basically doing to our technological marketplace). I think this same logic will apply to beliefs. If you have a fierce base of 5s that make up 10% of the population, they will spread their ideas quickly, and I do not deny this. However, the likelihood is that they are spreading their ideas to people who will be 4s and 3s. Politically, I am of course speaking of independents and aligned "moderates" who do not "stick to their guns" as often as true leftists and rightists. So, though the minority may have more power in the short run, in the long run the only way they will maintain a high amount of support for their belief is by recruiting more 5s. And it tends to be pretty hard to recruit 5s when you come from a standpoint of extremism and basically deny mountains of evidence that stand contrary to your point. Hell, if I didn't know so many people who denied evolution myself, I wouldn't even believe that their extremism and painful denial would get them many 3s. Then again, maybe I assume too much of people. Maybe they are so feeble as to fall in line with a bunch of fierce advocates simply because those people are more dedicated. "More than 10% of the US population believes in Young Earth creationism..."
Which leads to a pretty good counter-example to the 10% theory. At some date - in fact, we can pinpoint this pretty closely as July 1st, 1858 - only a handful of people - Darwin, Wallace, and the handful of people that Darwin had shown his preliminary work to - believed in Darwinian evolution. Within a year or so, after the publication of "On the Origin of Species", this had grown to a large number, and in the following century and a half the number rose fairly quickly, then plateaued, as it included basically everyone except the YECs and others committed to a religious worldview. The same seems to be true of many scientific theories - relativity, quantum mechanics, plate tectonics, and more. When introduced & supported with evidence, they spread fairly quickly from a handful of believers to encompass most of the educated population. Ok, but once the 10% population expread their idea, there will be again another 10% against it, does this means it will always be a fight between this two groups? it seems to me that one critical real world factor they are missing is changing the social graph with belief over time. If someone is committed to a particular belief, it is also more likely that they will loose ties with people not as strongly committed, and gain ties with other committed people. It seems to me that adding such a behavior could easily lead to a fractured social graph, more akin to what we see in current times. That would also explain why small towns, where is is much harder to change your social graph, are more likely to end up in a situation where everyone goes to the same church, shares similar political beliefs, etc. Kind of depressing to think that we are all just a heard of sheep waiting to the next 10% fad to come along. There are a lot of 10%'s holding crazy ideas that fortunatly will never make it to the mainstream. Surely the 10% theory has to attach to a good idea or opinion. Can you guys please add a Google+ +1 option? Thanks! This is absurd on its face. If <10% would take "the age of the universe" to catch on, then how do you ever get 10% to begin with? Wouldn't that imply that the only ideas that would ever dominate the culture are the ones for which at least 10% held that belief since time immemorial? But that's clearly not the case, we frequently have new ideas -- sometimes starting with a single person or very small group -- that come to dominate the culture in a short amount of time. Exactly. Large numbers grew from small numbers, so a point-in-time measurement of less than or greater than 10% doesn't make sense. Next Post »A Scuffle over "Scuffle"